In a previous Science Snippet we have seen that a solar panel and speaker can make the fast on/off switching of a light beam, audible. But that’s just the start. If we “modulate” the light beam, then we can use the light beam as a carrier wave of sound information. View below and be prepared to be amazed . . .
Connect the phone earphone socket to the flashlight and turn the volume up. Shine the flashlight beam on the solar panel. Block the beam with your hand. Prepare to be amazed! Point the solar panel at a AC light source and the humming sound will indicate the changing electrical cycle. Shine a flashlight beam onto the panel and there will be no humming sound. Cut the beam with your fingers to get a clicking-switching sound or try a laser pointer with the same outcome. Interestingly, this may be the first time many people hear the fingerprint switching sound of alternating (AC) and direct current (DC). Of course, many know the rock band, AC/DC. Most electronic screens and monitors are refreshed at a high rate. Investigate the invisible frequency by walking around the school / house and pointing the modulator solar panel at different types of screens, eg. a computer monitor, cell phone screen, TV screen. You will hear a wide range of frequencies. Also try the remote controls of the TV and any novelty light-up source, such as the bulb shaped LED light included in the kit. When you talk into the tube, the sound pressure waves travel down the tube causing the elastic film to vibrate. The light hitting the mirror would normally reflect off at one angle but now because of the vibrations, the light is scattered at various angles. 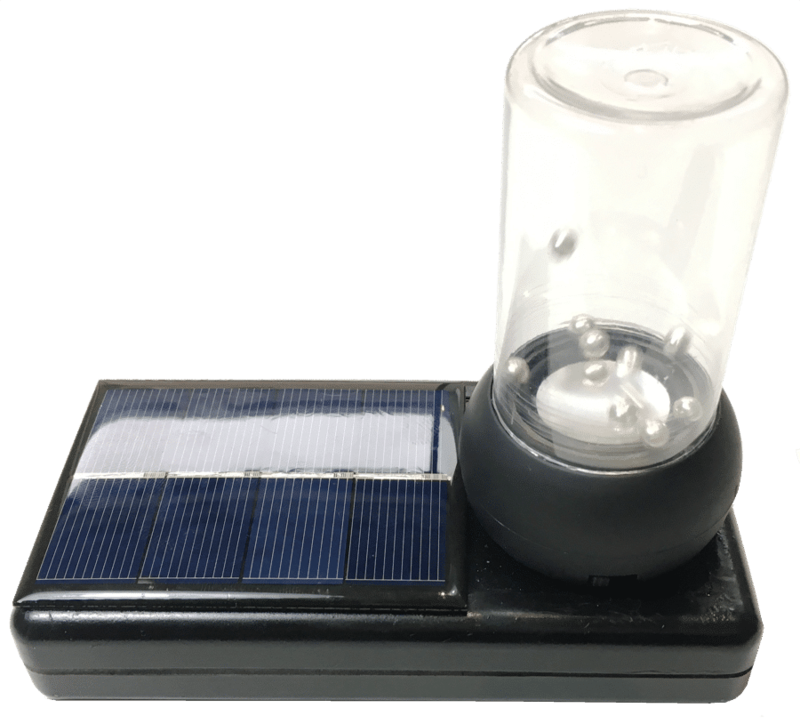 This will vary the light intensity reaching the solar panel, so the voice vibrations are converted to variable electrical signals! Most students are familiar with the vibrations produced by the open cone of a speaker. For this demo you will need to position the modulator receiver so the speaker faces up. Add a number of the small beads supplied, to the speaker cone and cover with the acrylic bottle. Turn the system on, play a song at low volume and gradually increase the volume. 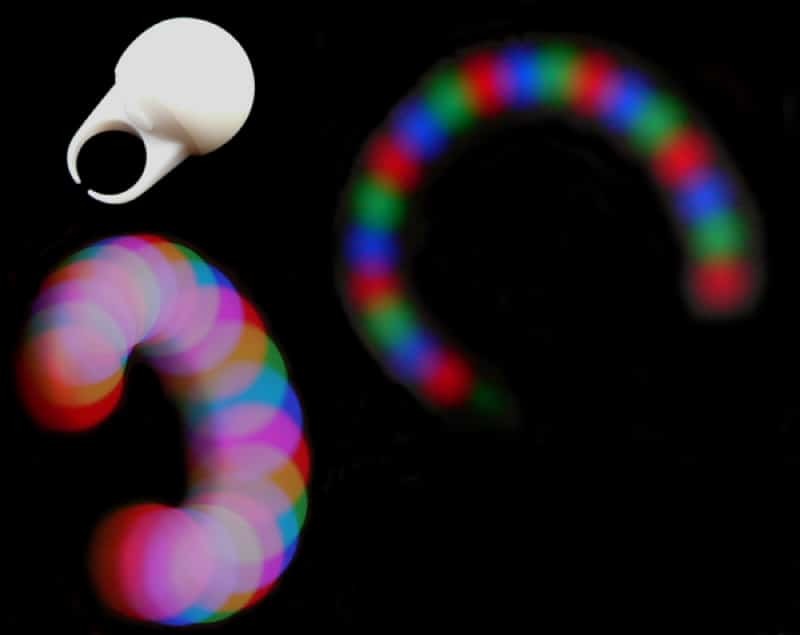 Note how the beads’ random movement increase with an increase in sound energy. Explain to the students that you will use sound energy to model heat energy to visualise a change in state, eg the melting of ice or the evaporation of water. 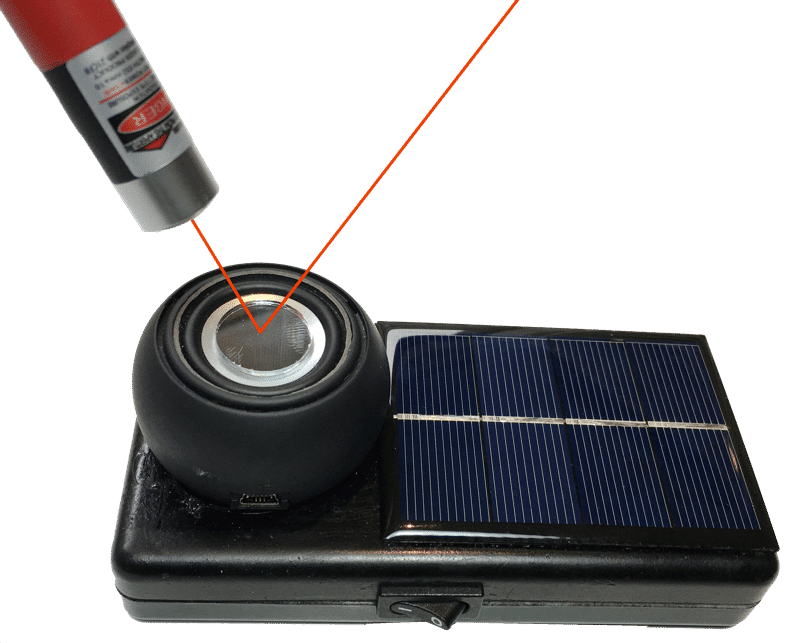 Activate the included RGB strobe ring and gradually bring it closer to the solar panel. (The ball contains a red, green & blue LED that flickers at a fast rate). You should hear an increasing humming sound. Point out that the increasing kinetic energy of the speaker is transferred to the particles which is equivalent to heat transferred from a hot plate. The higher the kinetic energy (heat), the faster the molecules move and some of the “molecules” may even gain sufficient energy to escape the liquid and enter the gas phase. 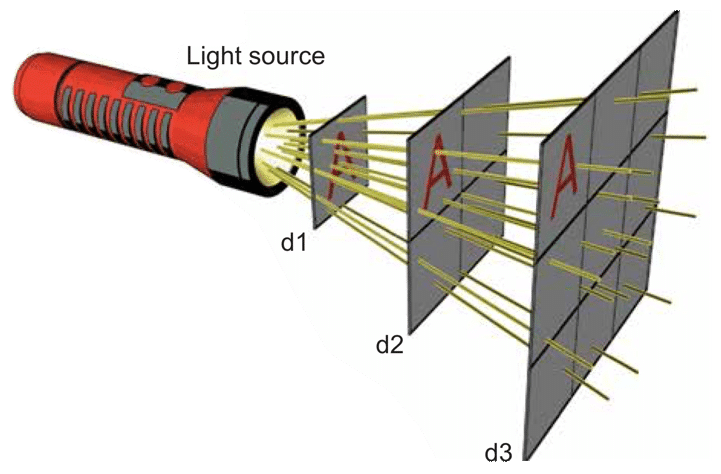 The Inverse Square Law states that the intensity of light decreases as the inverse square of distance (1/r2) This means that the light intensity at 1m from the source will decrease to ¼ at 2m and 1/9 at 3m from the source. Can you prove this in a qualitative way? It is important that the students realise that the sound volume is proportional to the amount of light that strikes the solar panel. Activate the modulator and play a song. 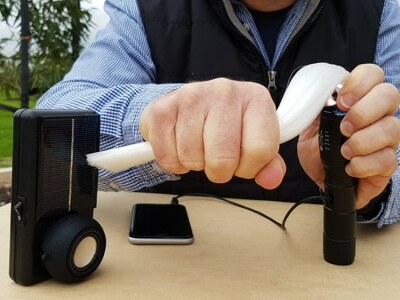 Start with the flashlight 1m from the solar panel and move back 1m and then another meter while observing the volume changes (which is proportional to intensity). For this demonstration you will need a cheap fibre optic bundle from a gift shop. These are often available as part of a table light display with a colour changing LED base. Activate the modulator and project the light beam into the fibre optic bundle. 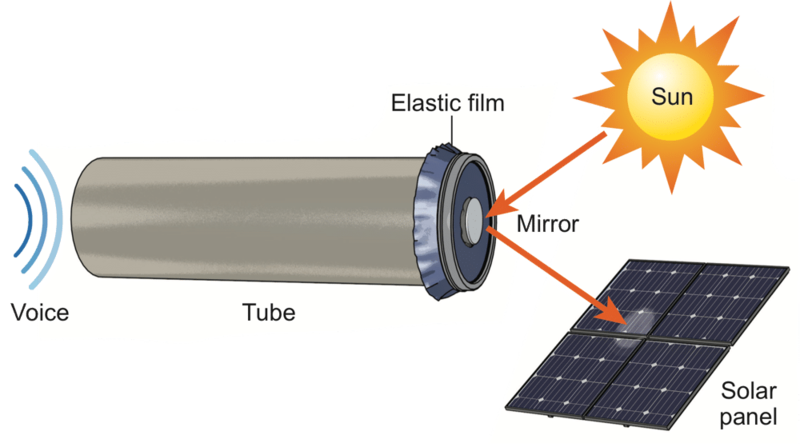 Bend the fibre optic bundle to demonstrate internal reflection and point at the solar panel. 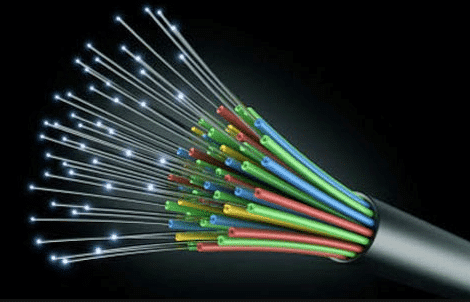 Modern communication systems use modulated signals carried by light beams in clear fibre optic cables. This forms the basis of the new LiFi technology and the NBN (National Broadband Network in Australia). [Optical fibre bundle not included]. You may use any novelty light that uses fast flickering LEDs. A few useful ones are the strobing RGB ring (included), a rotating fan with LEDs and the light writer fan. Activate the modulator receiver & dim the lights. 1. Ring: Hold the fast flickering ring in front of the solar panel to hear the quick switching of the LEDs. Then move the strobing ring in circles so the images gets spread out on the retina. Now you can clearly see the flickering red, green & blue LEDs. 2. Fan: Hold the lit up fan’s blade stationary in front of the solar panel to hear the fast switching LEDs. Then let the blade freely rotate to see the ‘merged’ persistence of vision effect. This is exactly what happens when you visit the cinema. We modulate the light beam. Everyone knows about the AM and FM on their radio. AM is amplitude modulation and FM, frequency modulation. 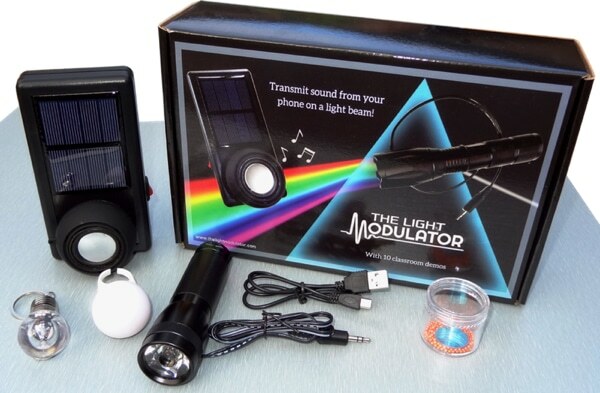 The radio uses radio waves as carrier beam but we can use visible light waves too, as all are electromagnetic waves and therefore can be ‘modulated’ to carry information. 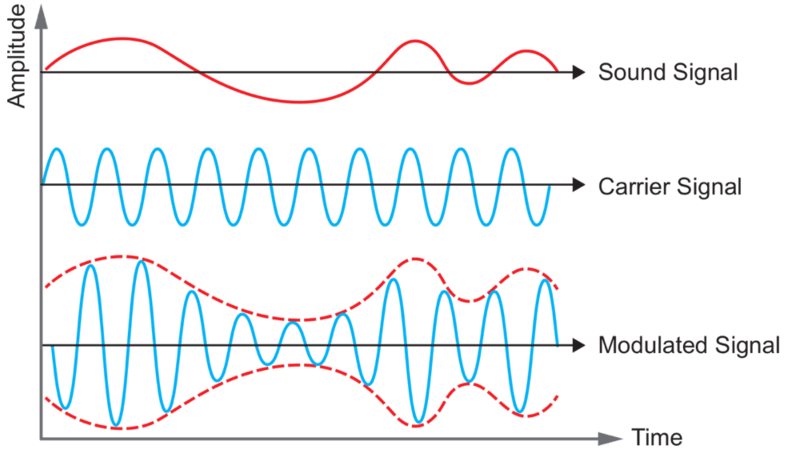 Modulation is the changing of the amplitude or frequency of a wave so it is in synchronisation with the variations of a second signal. The carrier wave simply carries the information superimposed on it by the information wave. Its waveform undergoes a change so it gets “modulated” with the information signal. The sound signal can be from any electrical audio source. The variable sound signal is fed into the light (carrier) signal, and the intensity (or amplitude) of the light beam changes so its reflects the information from the sound signal. 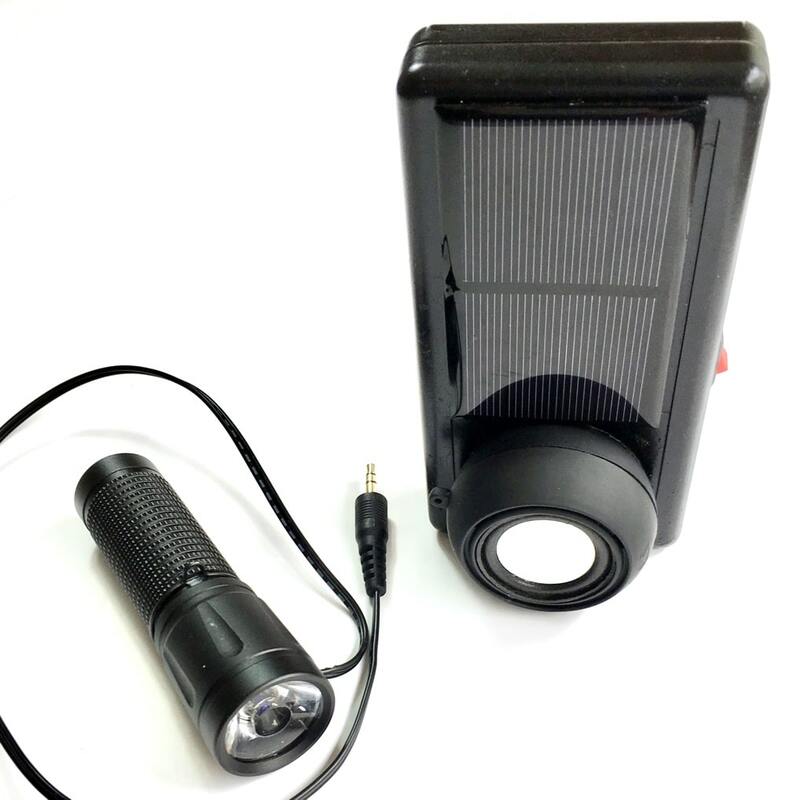 These flashlight changes are minute but are detected by the solar panel which in turn mirrors its output to the same pattern. The sound signal is virtually riding on the back of the carrier beam and goes wherever the carrier beam goes! Who did the first modulation? Graham Bell, the inventor of the telephone. The use of audio-modulated light beams for communication pre-dates the first radio telephone experiments by almost 25 years. 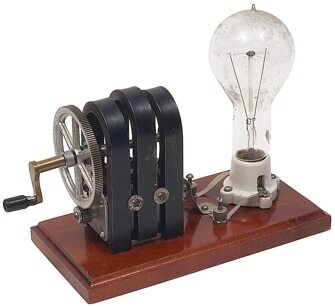 On 19th February 1880, Alexander Graham Bell and Sumner Tainter, his laboratory assistant, became the first people to transmit their voices over a light beam. They used a vibrating mirror system to superimpose sound onto reflected beams of sunlight. 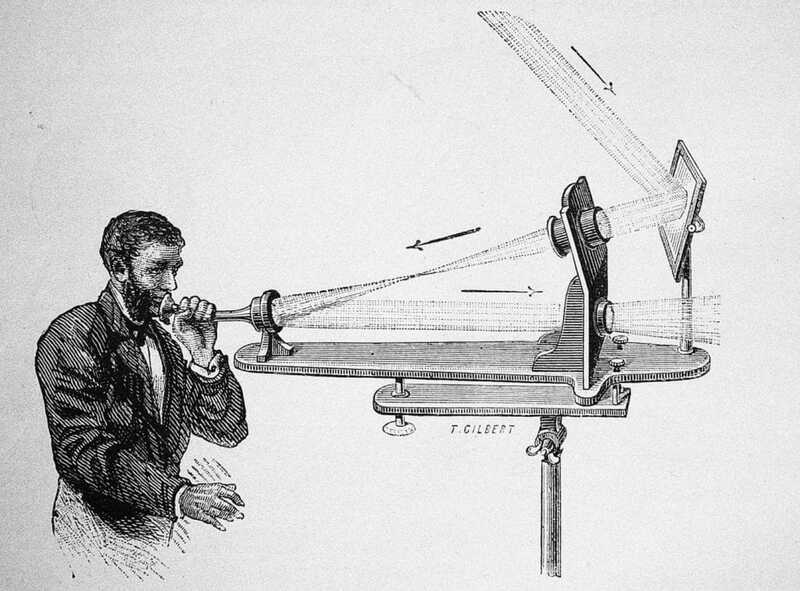 Bell named his invention the “photo phone” and said it was fundamentally a greater invention than the telephone.